Designed with DIY professionals and gaming enthusiasts in mind, the SeaSonic SSR-650RM power supply delivers first-class quality, reliability and stability at a price that won't make you wince. 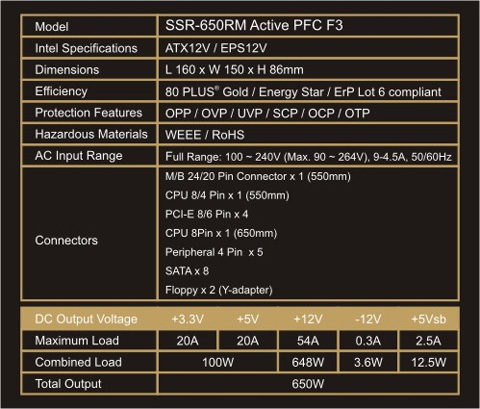 This PSU is 80 PLUS Gold rated and delivers robust power through a DC to DC converter design. Engineered with only premium components, including premium capacitors and heavy-duty protection circuitries, the SSR-650RM maintains continuous output with tight voltage regulation for trouble-free operation in any situation. Performance is not the entire story. The semi-modular cable design reduces clutter inside the chassis, and the intelligent fan control system perfectly balances noise and cooling, allowing you to game or work hard with full confidence and peace of mind. 3.39" x 5.91" x 6.30"
Pros: Gold efficiency, modular, near silent, reliable. Cons: Some cords like the 24 pin connector may be a tight fit in larger cases or awkward positions on the motherboard. Other Thoughts: I've had 3 of these in my builds for 1-2 years and they're all working fine. If I were to build for my friends I would probably pick up another one of these. Other Thoughts: Had this power supply for over a year, haven't run into any hiccups, coil whine, loss of power, or anything of the sort. 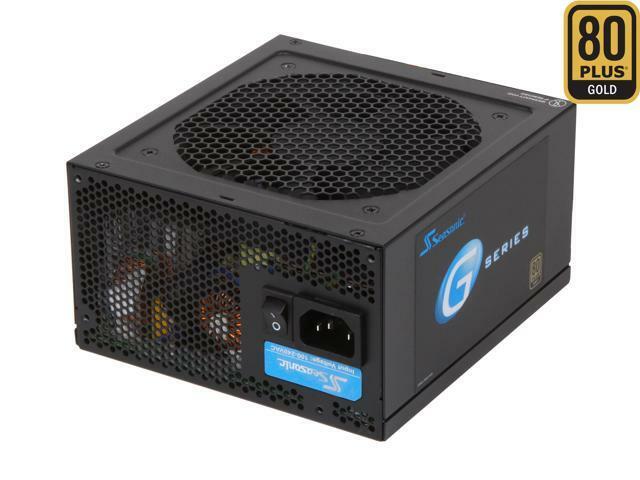 Love seasonic, and will continue to buy their power supplies over anyone else! Other Thoughts: Bought in Nov 2015, and continues to work fine, though I may retire this computer in favor of another build. If I can get away with reusing this PSU I may just do that. 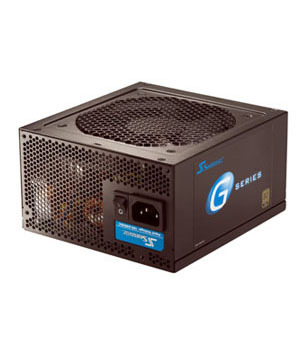 Pros: -Seasonic brand is always quality. Cons: -No fully modular. I didn't realize this when I ordered, but it doesn't bother me enough to take a star off for. The Corsair Carbide case that I was using for the install has a bottom that covers the PSU, so the extra cables are not visible. Other Thoughts: I've had other brand's PSUs burn up on me, and leave me in a lurch while waiting for RMA. Luckily I've never lost components, but I knew it was only a matter of time, so I now look for quality over price. Can't go wrong with Seasonic. Pros: *No more permanent wires than are necessary. *Runs cool and has a quiet fan. Cons: *None, provided there are no unpleasant surprises in the next few years. Other Thoughts: Nifty Seasonic case badge and velcro straps. UPDATE 3/3/19: Still works perfectly. I'll be upgrading my system soon, but I plan to continue using this PSU in an HTPC. Fantastic product. Pros: - Just a good PSU, good quality, no issues in almost 5 yrs. Other Thoughts: *knock on wood* hopefully this PSU stays strong for years to come still, not go kaplunk after me writing a very positive review like life goes sometimes..
Pros: Semi modular design means the 24 and 8-pin power are not modular but since every motherboard requires them then it is a no-brainer to have them NOT modular. Many power cables to allow for many video cards, drives, etc. Quiet operation and looks good. Cons: I do not know if it was me or the PSU but the non-modular 8-pin cable did NOT work with the CPU power slot on my motherboard. I had to plug in a separate 8-pin power cable to use for the CPU power slot. No big issue there but then the PCIe non-modular cable did not work with my video card, I had to plug in another PCIe cable into the modular PSU to get the video card to work. Bummer the non-modular 8-pin CPU power cable and the PCIe cables do not work. Just have to shove them in the back of my case cause I cannot do anything else with them. Pros: Rock solid PSU. Efficient. Modular. Safe. 5 year warranty. Cons: On the pricier side. It could be argued that the efficiency savings from the Gold rating are not justified - you may save only a dollar a year on electricity versus a bronze unit, depending on your electrical costs in your region. You're also paying a bit of a premium for branding, and honestly the modular cables aren't much of a plus if you're putting this unit in a case with a PSU shroud -- if you can't see the cables, who cares if you have a non-modular psu? Other Thoughts: I'm giving this 5/5 eggs because I'm perfectly happy with it, it's being used in a case which benefits from modular design (in a Rosewill mATX case, very little room for cables and no shroud), and I know it's dependable.